Hi Loves! My empties bag for the winter season was a little bigger than I realized, so I’m breaking it up into parts. The past few months I’ve been working through a lot of samples too since I have a ton. I’m sharing my thoughts on any samples that left an impression – good or bad! This is part 1 – skin care empties. I’m on the fence about regular “masking” because it can be time consuming to do them multiple times a week but on the other hand, it can be a great opportunity to relax. I used three over the winter months – clearly I don’t use them often but here are a few to share. This was ok. It had a cooling effect as I put it on and dried before I removed it. My face felt refreshed, but I didn’t see any drastic changes that would make me want to buy more. The Body Shop – Vitamin C Microdermabrasion – Verdict – BUY! This was fantastic. I picked up a few of these single use packets online for $1.50 each and there was a free shipping promotion at the time so I figured, I wasn’t out much if I didn’t like the formula. It has a super fine grit, almost like sand. I applied it to my face for a couple minutes and then washed it off. One tip – the grit is soooo fine, that I would suggest using this and then jumping in the shower. I felt like the grains were every where as I was rinsing my face off and think it’d just be easier in the shower where you can wash it all away. This reminds me a lot of the Boscia Detoxifying Cleanser but it felt a lot more drying than the boscia one, so if you have oilier skin, this might be a good choice for you. First Aid Beauty – Face Cleanser – Verdict – BUY! I really liked this, its very luxurious and feels good if you have drier skin. My skin has been oily/dry all winter and this was a welcome relief. I would recommend this if you have drier skin, but if you’re oily, this might be too heavy. This was a gift with purchase and lasted quite a while. I used it at night to help ensure that I got my daily makeup off. However, it wasn’t anything amazing so I think I’ll keep using my Thayers Witch Hazel toner instead. Boscia Self-Defense Vital Antioxidant Moisture w/ SPF 30 – Verdict: Not for me! I’ve mentioned my combo skin, and this left my skin feeling oily and tacky from the sunscreen. Even hours later, I still felt like my face was grimey which is not something that I’m into! If you have normal skin, or dry skin, this is probably fine…my skin just wasn’t into it! First Aid Beauty – Ultra Repair Cream – Verdict – BUY! Boscia Enlivening Amino-AG Eye Treatment – Verdict – LOVE! I started using eye creams to help with my dark circles, while this didn’t really make a change, it felt amazing and kept my under eyes moisturized and that’s good enough for me. It has a very silky feel and my skin just drank it up. I’ll be buying this when I work through a couple that I’m experimenting with. Tarte Maracuja C-Brightener Eye Treatment – Verdict – Good…not great! I was all into this before I tried the Boscia one above. Both were deluxe sizes that I used consistently for at least a month on each one. This is a little thicker, but worked nicely. It is super moisturizing and has a little bit of brightening to it. If boscia quit making theirs, I would come back to this one. Victoria’s Secret VS Pro Eye Shadow Primer – Verdict – Already purchased! In some other posts I mention using this and I love it. Its a very thin formula with a little bit of color but in the end its pretty sheer. I use this almost daily (except lazy weekends) and paired with a cream shadow, my eye makeup is bulletproof! If you’re in the search for one, this is pretty great. Maybelline Dream Lumi in Radient – Verdict – Already purchased! I mentioned having dark circles – and this is my every day go to remedy to help hide them. This is great for every day and it works wonderfully. If I have a big event or something going, I use another product but for the most part this is what I use day in and day out. This is either my 3rd or 4th one. Down Town (Calvin Klein) it was nice, and reminded me a little of Euphoria but lighter. I would consider this for every day. Especially Escada Delicate Notes This was perfect for a weekend or work day. Very light but not super floral. I would consider this as well. Whew! 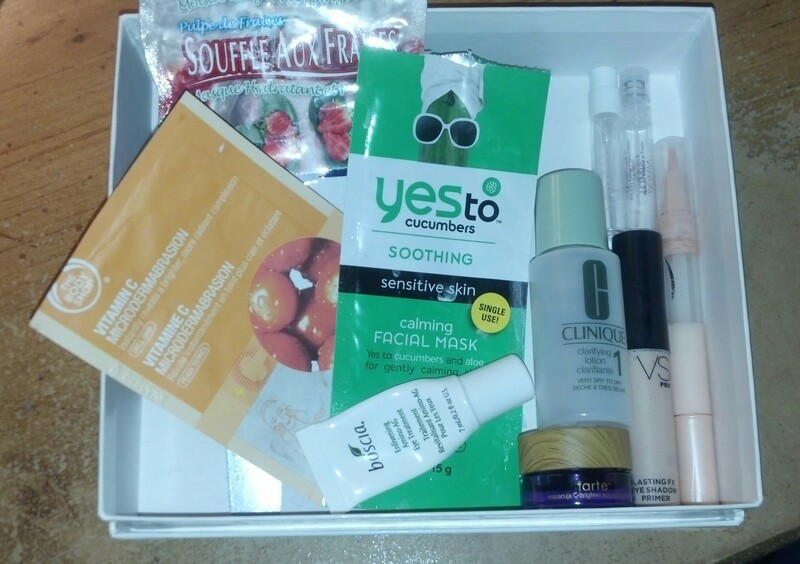 Thanks for making it to the end of my empties box! 🙂 There will be another part coming soon, I hope you’ve enjoyed reading about a few products and what my thoughts were.